"To challenge democracy is brave. To do it in print is heroic." With simple, straightforward arguments they show that democracy, in contrast to popular belief, does not lead to freedom, civilization, prosperity, peace, and the rule of law, but the opposite: to loss of freedom, social conflict, runaway government spending, a lower standard of living and the subversion of individual rights. In just 102 pages they debunk 13 great myths with which democracy is usually defended. What is more, they offer an appealing alternative: a society based on individual freedom and voluntary social relations. Do you wonder why government keeps growing bigger and the public debt keeps getting higher, while your freedom and prosperity look ever more threatened? After reading his book, you won't wonder anymore - you know why it is happening and what can be done about it. 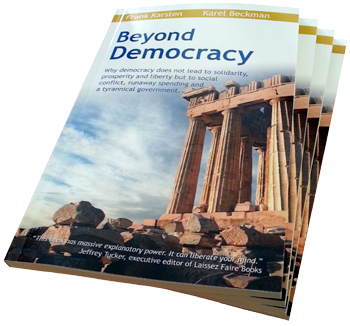 Beyond Democracy is a groundbreaking and fascinating book for everyone who wants to better understand current social problems and the economic crisis. "Even if you think you disagree, you owe it to yourself to consider their argument. Their prose is clear. The evidence is compelling. The logic is challenging, if not impeccable. If you still want to believe after reading this book, that’s up to you. But please accept the intellectual challenge."